Finally, the analysis is here! Feel free to ask in comments for any unclear part. The length of any simple path in the initial graph doesn't exceed n, so there are no more than n - 1 edges to delete and check. A solution for 1B pairs node a[i] with a[i + k] where a is the list of nodes sorted according to dfs visit time. Can someone prove why this works? I applied the same logic as explained in editorial for Div2B but still get WA on testcase 31. Please help. Sorry, if I am asking a lame question but what is wrong with that? set::size() returns size of a set whose type is size_t, which is unsigned int. So overflow on multiplication. but isn't the max size of row.size and col.size = n? so row.size * col.size = n^2 and we did use n^2 in the formula. do you like it so much !? Let's call a good substring either a single character, or a substring starting and ending with a smaller good substring, with no other occurence of that smaller substring in the middle. A maximal chain can be transformed into another maximal chain of good substrings, so we only need to consider those. The repeated substring of a good substring is the previous good substring in the chain. Actually, there are exacly n good substrings : for each position i, we can consider the largest good substring starting there. It can't appear right of it, or we would have a larger good substring starting at i, and if it appears left, it can be matched with the occurence at i to make a larger substring. It also means we can build a tree on good substrings (i.e. on string positions), with an edge from s1 to s2 if s1 is the repeated substring in s2. We are interested in the depth of that tree. Let's build the tree incrementally. We process the string from right to left (in increasing size of suffixes). We want to be able to compute at each position the size of the good substring. Assume we are at position i, with parent j. We know that substring s starts at i and j and we want to compute the size of the smallest substring starting at i with two occurences of s, i.e. the substring with exactly two occurences of s. Let's assume for now that we can know the last time we saw s. Then we know the size of the good substring of i. We can use the suffix array to find all other positions starting with s, and set i as their potential parent (i will only end up as an ancestor). So the only thing left is to compute the last time we saw a good substring. When we see a substring, we can propagate our position upwards in the tree (update all its ancestors with it). It is however too slow, as the tree can have depth O(n). We can transform this by setting a value in one node and doing subtree minimum queries. Subtree minimum queries can be solved using a segment tree on a static tree, but here building the tree and queries are interleaved. A solution could be to use an euler tour tree, but it is actually possible to use a segment tree in this case, as even though we don't know the shape of the tree in advance, each time we add a node, we know the size of its subtree (the number of substrings starting with its good substring), so we can give it a range in the segment tree with the same size. rmq<lli> R(sa.lcp); // build a rmq data structure on the lcp array (to get in O(log n) the range of suffixes starting with a substring). int lp = last.query(lfrom[p], lto[p]-1); // minimum subtree query on the parent : last seen occurence of the parent's good substring. // i + size[i] = lp + size[p] : this good substring ends at the same position as the last seen occurence of the parent's substring. int from = R.queryLowL(j, size[i]); // find the range of positions starting with the same good substring. lfrom[i] = *pcur; lcur[i] = lfrom[i]+1; lto[i] = lfrom[i] + to-from+1; // get some space in the last segment tree. *pcur = lto[i]; // tell the parent we used some space from its segment. t.set(from, to, i); // set the potential parent of positions starting with the same good substring. for div1B , i have no idea why my logic works , can someone give a proof/intuition. http://codeforces.com/contest/700/submission/19370545. I sort the 2K nodes according to dfs start time and pick nodes i , i + k.
This is also the solution I've come up with. At first I was in doubt that it was correct but I counted on my intuition. Could you please add contest tags? No idea what you are saying in 701D As Fast As Possible and 701E Connecting Universities... The description is really inaccurate. Can anyone explain the solutions in more details with better notations? P.S: I know the formula solution to 701D. But I don't know how to use Binary Search in this problem. Everyone gets on the bus for the same amount of time, because we are trying to optimizing the time, so everyone should arrive the ending point at the SAME TIME. That means the bus is going to be going forward for (amount of each person's bus time share) * (groups of people) on the bus, and going backwards for (groups — 1) times to pick up the next group of students to get onto the bus. Each person's bus time share: (dist-v1*t)/(v2-v1), supposing that we are covering the distance which can't be covered by bare feet. Amounts of group: ceil(n/k), everyone is only getting on the bus for ONE time. 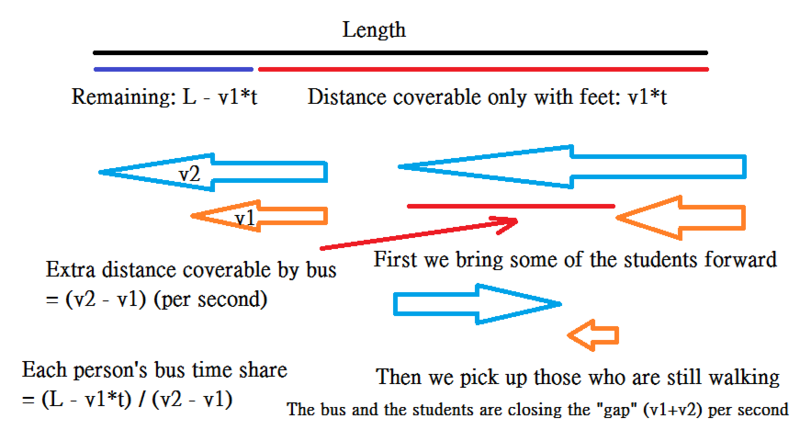 The time of the bus going backwards: (gap distance) / (v2+v1), we have to drive backwards to pickup the students who are not on the bus yet. Total bus time required: (bus time share) * (amounts of group) + (pickup time) * (amounts of group -1). All these observations are made under one assumption: The given graph is a tree- that means for two nodes there are only ONE(non-backward) path between them. Obviously for A we will try to get C or D, so does B... The question is: How do we determine if we are going to guarantee that there is such point C and D on the other side for A and B to connect? Here's an idea- we will try to find a point that has K universities on one side, and another K universities on the other side- In this way every link is going to pass through to point, and the total cost will be the total distance of all points from this central point. But don't be fooled! During a dfs search there are only children's — you can't determine if those children can be splitted into two sides. That's why we should be finding the point with the LEAST amount of child which has AT LEAST K children has a universities. In this way we can guarantee it is the central point we need. Now you should notice there is one thing left- Where is the root of the tree? Just pick any leaf of the tree and assume it is the root. That will do the job for searching the central point. "That's why we should be finding the point with the LEAST amount of child which has AT LEAST K children has a universities. In this way we can guarantee it is the central point we need." In my opinion, this is not obvious and should be proven, which I will do here. What your algorithm really does is find a point such that the sum of the number of universities in its children and itself is ≥ k, yet that sum for any of its children is < k.
We find this point by starting with 1 which has the sum = 2k > k.
If there is no child with sum ≥ k, then we have found our point and stop. Otherwise, in the case that there is a child with sum ≥ k, then we go to one such child. We know that this process must end eventually, because otherwise, we'd be infinitely going down the tree which is impossible since there are a finite number of points. Therefore, we continue this process until we stop, at which point we have a child with sum ≥ k, but with all its children < k.
Now, we make this child the root of the tree. What we want to prove is that we can create a pairing such that each pair goes through the root of the tree, which would obviously have maximum distance. This happens only when each pair has the lowest common ancestor of the root and we do this by mapping a university under one child to a university under another child. The new root has all of the children it had before, all of which had sum < k, plus the fact that its parent from the tree is now a child, which must have sum ≤ k because of how all of the other children combined have sum ≥ k and there are only 2k universities. This means each child has ≤ k universities under it. Now, each of the children of the root has a subset of universities and the root itself has a subset of at most one university, which creates an exact cover of all 2k universities where each university is covered by some child, but no university is under more than one child because that is impossible in rooted trees. Since each subset has ≤ k universities, all of the others combined has ≥ k universities (since there is a total of 2k), so there is an injection from the universities of each child to the set of universities from other children. Now, by proving that there is an injection from the universities each child to the set of vertices from other children, we have proven that we can map one university under any child to a university from another child without having repeats, meaning pairs can be made between universities of different children using all of the universities exactly once, which is exactly what we wanted, so we are done! "Consider that the embarkation and disembarkation of passengers, as well as the reversal of the bus, take place immediately and this time can be neglected". It means that it don't take time to turn the car around, or you could consider that the bus could drive backwards at the same speed. Can the bus drop the passengers in the middle of the path and return to bring the other passengers or each time it has to reach the destination? The way they explained 701D with binary search was extremely convoluted, but hopefully, my binary search solution with comments will help you. The problem with their solution here is that their explanation is out of order, they never actually show their equation for what I called x, their variable posM convoluted their formula for x, and they never actually solve for what I called y but instead briefly mentions to account for the bus going back. However, I think the way they explained 701E pretty well other than the fact that lv is unnecessary since lv = 1 for all v. However, it is missing A LOT of detail if you're not so good at working with trees. Here's my commented implementation of the editorial solution. Really nice explanatory comments! This shows the best way to understand a solution approach is to go through well commented codes implementing that approach. Can you explain as well how the direct formula is derived? On a side note, in your code, you could have used ceil() function to compute the number of groups. Is there any reason for not doing that? The way I first derived the direct formula is kind of complicated (a linear system with numGroups number of variables and equations), but once we have the binary search solution like mine, this becomes more clear. Since x is constant for each group, we are basically adding numGroups*x to timePassed. Since $y$ is constant for every group, we are basically adding (numGroups-1)*y to timePassed. The left-hand side is the answer to our equation, giving us a very short solution. Also, yes, I could've used ceil() function to compute numGroups in my original solution. I could've also done (totalPupils+busSpace-1)/busSpace in order to keep integer division. However, I chose this way just because it's the way I first figured out how to do it before I knew that I could use ceil() to before I knew about the "adding denominator-1 to numerator" trick. It's just a habit. Why is eps 5e-7 ? I don't quite get the part of optimizing the Huffman code implementation, can someone please explain it a bit more? For 701C, it seems that all the information are there, but have been put in such a haphazard way that it doesn't make much sense, or may be I am not that smart. The confusing part of their answer is that they're not really clear about when they're talking about looping through the different types of letters in s or all of the letters in order. However, here is my commented implementation of their solution. However, in someone else's editorial, they considered instead first where first was the least index greater than i where going from string[i] to string[first] was a valid answer with all possible types of letters. With a small modification, this can be in O(n), which is certainly optimal. Finally, for those wondering what the "binary search" tag is for, here's a commented solution containing binary search. Does anybody have a clear explanation for problem D Div2? In the analysis for 701E - Connecting Universities, I understood everything except for this statement. "By the properties of the tree, paths from a to c and from b to d cover all edges of the paths from a to b and from c to d plus some extra edges, meaning the current answer is not optimal." Could someone show me the intuition/proof for this property? This is the first time I am explaining someone here on editorial comments. So if there are any issues please let me know. So considering a,b and c,d as connected universities is not an optimal solution. Now even if v is not lca still similar things will hold because that lca will lie inside the sub-tree of v and edges from that lca to v will fall inside the extra edges. There are several mistakes with this proof, unfortunately. Firstly, c maybe an ancestor of v. In which case you don't have to go all the way upto u and youre just adding a term. v may not be the lca of a and b. It makes more sense to consider, lca(a,c) and lca(b,d) separately both of which will be ancestors of v.
I have written a proof. Will post it in a while. Let p(x,y) denote the length of the path between x and y. To prove: p(a,c) + p(b,d) > p(a,b) + p(c,d). Here, the first term of R.H.S is >= p(a,b) as already shown. The second    term of R.H.S > p(c,d) since it is a path from c to d that doesn't go to LCA(c,d) first. Note that it is strictly greater since v is not an ancestor of c or d.
Therefore p(a,c) + p(b,d) > p(a,b) + p(c,d). Regarding to Huffman Coding on Segment. I think it is fine as an algorithmic problem, I enjoyed coming up with a solution. However I am not sure whether it was properly used as a task on a contest. After getting solution cleaned it is , however it is significantly harder both to code and to come up with than whole family of solutions and given short amount of time on contest you should expect many solutions in that worse complexity. It is very dangerous complexity for n up to 1e5. Because of that getting this problem accepted boiled down to optimizing code in weird ways, playing with constants etc. Both of my friends who tried that problem on contest got their codes accepted only after that. OK, so you can say "It sometimes happens that TL is strict and you need to optimize your code" or "If you try to get nonoptimal complexity accepted you are doing it at your own risk", but it is hard to create very good tests to that particular task, so I bet there are exist tests which cause many of ACed solutions to be few times slower, so there was no possible way of properly estimating whether particular solutions will get ACed. What is worse CF is not ICPC style, so even after passing pretest you don't have idea whether your solution will get AC and it can turn out it will if you would change magic constant from 300 too 400. Those particular tests caused that using transitions in Mo's in O(number of frequencies) on a light DS turned out to be faster than using set (according to Errichto. My well-written submission after contest took 2,7s (TL is 4s) whereas there are submissions taking 0,5s with worse complexities. You simply can't predict final behavior neither as a contestant nor as an organizer which made it a raffle whose solution will get AC and whose will get TLE. Btw regarding to editorial it is not like "in order to avoid log in first part just use list". Neither of typical implementations of doubly-linked list allow you to insert element somewhere in the middle. Special adjustment to that task is needed which takes advantage of a fact that if we insert k then k-1 or k+1 was/is present just a moment ago/right now. Could you explain it further ? Or just simply comment short explanation on your submission code. I've been recently curious about the problems ! You only used long long to store the result, yet overflow may still occur since n,r,c are integers. Thank you very much for your attention and help. I really appreciate it. Interesting observation is that we are only interested in the longest word of each node of the suffix automaton of the given string (or the nodes of the suffix tree of the reversed string). 700E - Cool Slogans can be solved without any suffix structures, just hashing. My solution starts similar to Rafbill's — we can only consider only chains of good strings, where a good string is either one letter, or a string that has a shorter good string on the beginning and on the end, and nowhere else. Any optimal solution can be, going from the last string to the first, greedily transformed into this form. We start with one-letter strings for all the letters in our word, this is level 0. If a word ends up on level i, that means we can construct a chain of i good words following this word. If we have a string s on level i, we consider all it's occurrences in the input — if we take any two neighbouring ones, we can make a word on level i+1. If we just did this naively, then it would be too slow, because we would be "pushing" a single word with many occurrences through many levels (consider input "a" * n). However, if for a word on level i it's two neighbouring occurrences don't overlap, then it's good, because the word we add on level i+1 is twice as long. What if they overlap? Then we can see that this overlapping part is actually the word from level i-1. That means that those two occurrences of a word on level i must have been created by three occurrences of a word on level i-1. Going from the other side we can basically jump over useless operations — if on level i there are k consecutive occurrences of a string s, and all the k-1 substrings between them are equal, then we can already take all those k occurrences, and make a word on level i+k-1, instead of pushing this through all intermediate levels. If we jump over levels as described, then we can see that we never get a string with two overlapping occurrences on any level, and thus each word will "go through" at most log n levels, because it's size doubles. So each position in the input will be considered as a starting position of some occurrence, of some string, on some level, at most log n times, which makes the solution O(nlogn). The implementation is simple: for each level we keep a map from a hash of the word to all occurrences, and we sweep those levels in increasing order. Hi, I was trying to understand your solution and it turned out to be wrong. Here is a countertest: 13 abacababacaba The answer is 4(a -> aba -> abacaba -> abacababacaba), but you solution can't find 2 aba's in the middle and prints 3. IN problem CONNECTING UNIVERSITIES I get an answer if I use long long int for all variables. If the limiit is 200,000, even int should do right? I get wrong answer on test case 11 if I use long int instead of long long int. Could someone please tell me how there is an overflow? Consider the tree that is just a 200,000 length path (say the vertices in the path are in order 1,2,...,200,000) with a university on each vertex. Think about what the answer would be in this case (it would be too big to represent in a 32 bit int). Can somebody show me how to give the formula for 701D - As Fast As Possible? I have read through quite a number of submissions, but still cannot understand the formula. Thank you. Here is another solution to Problem 701C: Submission Link. Initially store the indices of a char in a array. So create a array of array to store the indices of all the character. Now the basic approach is to find the length of the string, that contains all the different char, and which starts from a index i. Once we find the size for i=0. We just need to iterate once to find the length of the string for each i. Keeping in mind, when going from i to i+1, we only need to look where char input[i] is located next and keep track of the min string found so far. The problems are really nice in this round, so I hope someone will update the tutorial for problems C,D,E in Div.1. Server time: Apr/26/2019 11:44:47 (g2).